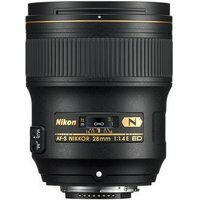 The Nikon 28mm f1.4E ED Nikkor Lens allows you to render subjects sharply, even when shooting at the widest aperture of f/1.4. High-contrast images of distant subjects or low-light scenes can be obtained without needing to stop down the aperture. A minimum focus distance of just 0.28 m offers additional versatility.